There's a peach tree in my backyard that has a nasty habit of dropping its fruit before they have the chance to ripen. It's about this time of the season when the number of fruit on the tree has dwindled significantly, but the ones who do manage to hang on this long are just starting to get ripe enough to work with. Before they all hit the ground to rot or get added to the compost pile, its time to do something with them. A great trick for not quite ripened to perfection fruit is to use it in baking. A little added sugar and you would never know they didn't come off the tree that sweet. Be sure to taste your peaches before making this. If you're starting out with really sweet fruit, reduce the amount of sugar in the recipe. Butter a 9 inch round baking dish. 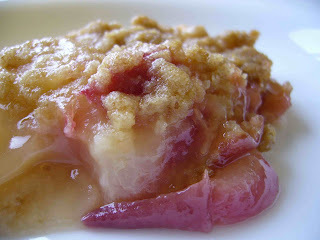 Mix peaches with 1/4 cup flour, 1/4 brown sugar and lemon juice and place in baking dish. Add remaining 3/4 cup of flour and brown sugar and salt to cuisinart fitted with the dough blade. Cut butter into small slices, add to cuisinart and pulse until mixture resembles wet, coarse sand (alternately you can mix the butter into the flour and sugar by using a pastry cutter). Sprinkle topping over peaches and bake for 45 minutes. Enjoy! yum! that photo is making me drool! You are so lucky to have a fruit tree. The only thing I can get to grow well in my yard, are pine trees. Wonder if the pine needles would soften up enough not to cut your throat is I put them in a pie?